“I was born in 1897 being one of nine children, four girls and five boys. One brother and three sisters died in their teens or early twenties. A very tragic family. “My schooling began when I was three years old and ended when I was 12. In those days you could go in for examinations to leave school if you were over 12 years old, the usual leaving age was 13 years. The exam was held in Shoebury and I am happy to say that I passed. This meant I was sent to work earlier in the brickfield. Part of my work was loading bricks onto a barrow with my father. 44,000 bricks were made a week then and I worked from 6 a.m. to 6 p.m. with three small meal breaks. 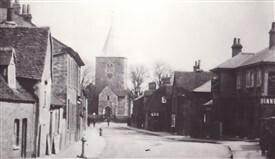 “Going back to my younger days, our church Sunday School was held in the old school in the High Street. To get a prize at Christmas one had to have a certain amount of marks. These were awarded each Sunday: one for attendance, one for good behaviour and one for learning and saying the collect of the day. I remember when I first joined the choir I was asked by the Choirmaster to to sing a scale to test my voice. I was very nervous but was encouraged by the organist who was my day teacher too. The church was heated by two barrack room stoves one of which was in the Lady chapel. In winter we used to go to church early and, keeping an eye out for the vicar or choirmaster who were in the vestry, we would warm ourselves round the fire, eating chestnuts. “We went on some good outings. One to Rochester Cathedral and another to the Crystal Palace. This meant we had to walk to Shoebury to catch the train as there were no buses then. The only transport from the village was a horse and cart which seated four and cost fourpence each! Returning at night we had the long walk from Shoebury in the pitch dark as there were no street lights. “Once we went to Foulness sitting in the back of a horse drawn wagon. We crossed on the Broom road from Wakering Stairs to Fisherman's head then went to the vicarage. There we played games and had a picnic tea. I can assure you it was no joke riding on that wagon which did not have springs – there were no roads on the island and no bridges. “My confirmation was at Prittlewell Church; transport was by the butcher's cart! On the way home we stopped at a shop opposite the White Horse pub and the vicar bought us mineral drinks.